Welding is an inherently dangerous job. Working with flammable gases, open flames, and metal can cause injuries to a welder’s skin and eyes if they do not have adequate protection. That’s why welding companies or businesses that employ welders must make sure they have safety gear on hand for every welder, for every job. Welding suppliers in Mississauga like Josef Gas can help you make sure your safety gear is up to snuff and readily available when you need it. As an employer it is your duty to provide a safe working environment for your employees. When it comes to welding that means not only maintaining equipment in safe operating condition and ensuring adequate ventilation and space is available to your welders but it also means having basic safety gear on hand and making sure employees know what they need to do to keep themselves safe on the job. The most common injuries welders experience are burns from sparks that land on uncovered skin, but eye damage is a big concern too. Eye protection is especially important because the damage can go undetected. Unlike sparks, which you can see and feel on your skin, UV radiation is hard to detect. You can’t see it but you can feel the heat. Eye protection is needed for all welding operations but some types of welding like arc welding, plasma arc cutting, gouging, or welding, and air carbon arc welding require full-face protection. Josef Gas has roots in the welding industry that go all the way back to 1969. That’s when our founder, Joe Stangl started supplying welding products and solutions. Now we sell all of the safety equipment you need to keep your welders safe in the workplace! We even have employees with formal training in welding to answer your questions and make sure you get the right safety gear for your needs. 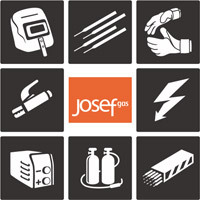 Call Josef Gas at 416.658.1212 or contact us online at info@josefgases.com to receive a quote or to speak to someone about your specific needs.